Andy Lum from Sony was taken to the official PlayStation blog this week to announce the upcoming free multiplayer weekend that will take place from this friday December 11th and is available for all PlayStation 4 players. 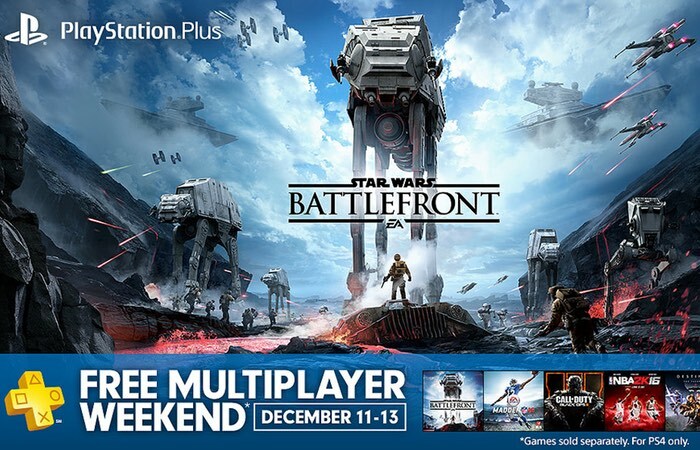 This weekend PlayStation 4 owners will be able to enjoy free online multiplayer access via the PlayStation Plus service which starts this Friday December 11th at 12:01 AM Pacific through to Sunday, December 13th, at 11:59 PM Pacific. Call up your friends, grab your DualShock 4, and get ready for some multiplayer gaming action this weekend. We’re bringing back free online multiplayer to all PS4 owners starting this Friday, courtesy of PlayStation Plus. What better way to check out the recently released free DLC Star Wars Battlefront Battle of Jakku before the premiere of Star Wars: The Force Awakens. To get started, log on to PlayStation Network during the free weekend period, launch your favorite multiplayer game, and you’ll instantly have access to multiplayer with your friends. There’s no membership commitment required to try out online multiplayer during this period.